Ahsa means to count and register. The root of this Arabic verb is counting by using pebbles as this is how the Arabs used to count. Allah, Praise and Glory be to Him, says, “But if ye count the favours of God, never will ye be able to number them” (IBRAHIM, 34), “..and of all things have We taken account in a clear Book of evidence.” (YA-SIN, 12), “..and count accurately their prescribed periods” (TALAQ, 1). Ahsa may also mean to calculate; Allah, Praise and Glory be to Him, says, “Then We roused them in order to test which of the two parties was best at calculating the term of years they had tarried!” (KAHF, 12), “..and He surrounds all the mysteries that are with them, and takes account of everysingle thing” (JINN, 28), “He does takean account of them all, and hath numbered them all exactly” (MARYAM, 94). 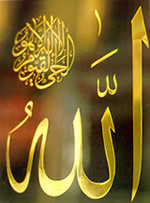 Allah, the All-Knowing COUNTER, is aware of every existing thing in detail; nothing escapes Him in heavens or on earth; He is the All-Seeing of the evident and manifest things; He is the All-Knowingof the hidden and invisible things; His Omniscience has no limit but isbeyond our perception because what He takes account of is unlimited. On Doomsday, those who indulged in sin and crime will be surprised by what they find registered about them; as we are told about them in the Qur’an, they will say, “Ah! woe to us! What a book is this! It leaves out nothing small or great, but takes account thereof!” (KAHF, 49). Allah says about the ancient nations, “All that they do is noted in their Books of Deeds. Every matter, small andgreat is on record.”(QAMAR, 52, 53). Allah’s power is unlimited; He takes account of all existing things, of the deeds of creatures, and of every single movement; Hesays, “Not a leaf doth fall but with His Knowledge; there is nota grain in the darkness or depths of the earth, nor anything fresh ordry, green or withered, but is inscribed in a Record clear to thosewho can read” (AN‘AM, 59). Praise and Glory be to Allah Who comprehends all things in His all-inclusive Knowledge and takes account of every single thing, Praise and Glory be to the All-Knowing COUNTER, He is Allah.